It's a tale as old as time and now it is joining Jim Shore's Carved by Heart series for the Disney Traditions collection. From Disney's Beauty and the Beast, this beautiful creation features Belle, Beast, Lumiere, Cogsworth, Mrs. Potts, and Chip enjoying a cheerful moment. The Carved by Heart series statues are made from stone resin, but are designed to look as if they've been carved from a tree log. 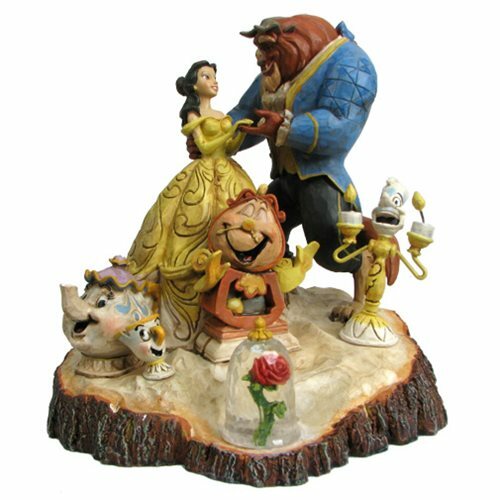 This Disney Traditions Beauty and the Beast Carved by Heart Statue measures approximately 7 3/4-inches tall x 7-inches wide x 6 1/2-inches long. Ages 13 and up.